After a whirlwind of a year last year, which kicked off with the amazing honour of being part of the 2015 Becky Higgins Project Life creative team, it has sadly come to an end. It still feels all a little too surreal to have had the opportunity and it was simply amazing! Not only did I have the chance to play with the whole year of digital project life supplies before they were released, but I got to work alongside some amazing talents and make friends with the beautiful team. I am forever grateful! But as life has since gotten a whole lot more hectic (and my poor blogs a little bit neglected), it was time to simplify even more. I switched to digital project life back in 2014 due to how incredibly time consuming my project life physical albums were. I am an embellisher so it was not as simple as slip in a pocket and go… plus printing photos can take a bit of time too. So digital was definitely a time saver but since Lily got older, spending time in the office on the PC became a challenge. She wanted to be in there and touch everything… which as a scrapbooker with an excessively large stash, it was a disaster waiting to happen. Then came Violet and my computer time is pretty much non existent. So it was time for to simplify my project life even more! Last year I did my pregnancy album using the project life app. It was quick, easy and perfect for those moments when I was dealing with horrendous morning sickness and didn’t want to leave the couch. Plus a lot of my photos are on the phone anyway. Not all… I do still like to take camera photos too for special events. 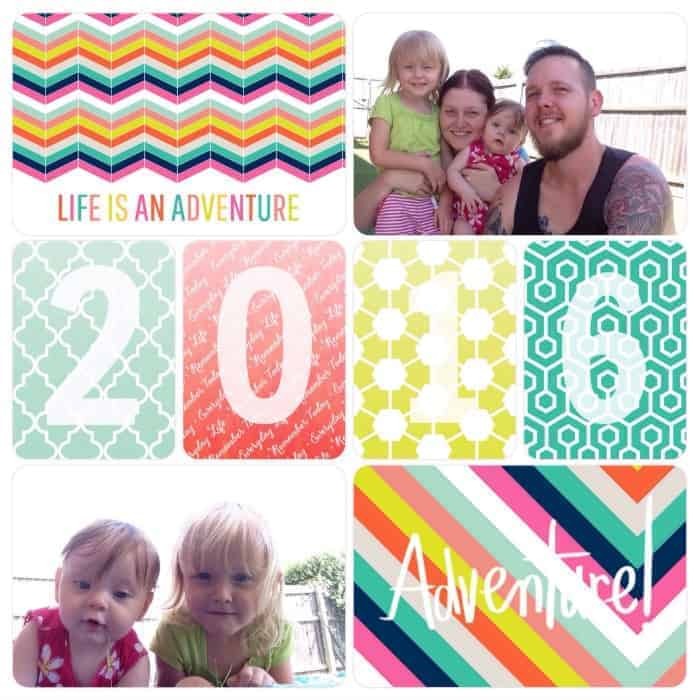 But this year I decided I was switching completely to the Project life app for my 2016 album! 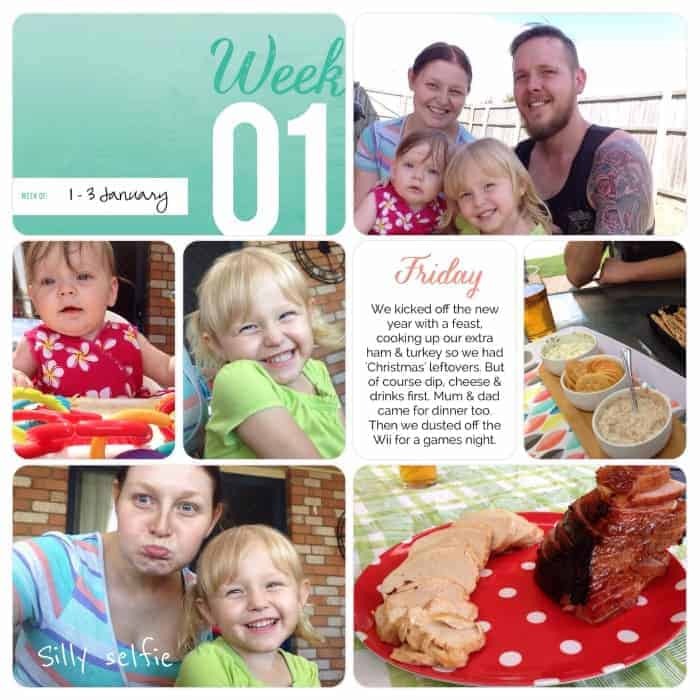 I absolutely loved the 2015 Project 52 edition from Becky Higgins and I did use it a couple of times in my 2015 digital project life album, but because I had so many choices last year, I used a different kit almost every week. This year I am going to give it a go of doing a co-ordinated album using just two kits (I can’t commit to just one… I like variety). So I am mixing it up with both Project 52 and Favourite Things Edition. They coordinate well and give me twice the options as a single kit! How are you doing Project Life in 2016? App for me too. I decided late last year that I was giving all PL away after Autumns first year album was finished but when I sent 2015 completed album off to be printed I really appreciated it all coming together. I am soooooo behind on Violets baby album and it’s digi lol I’m up to her first month. Big catch up ahead of me. Still about 2 months of 2015 to do too. Time has not been in my favour lately lol but the app makes life so much easier. I did last week’s layouts at 1am and it took 5-10 minutes!